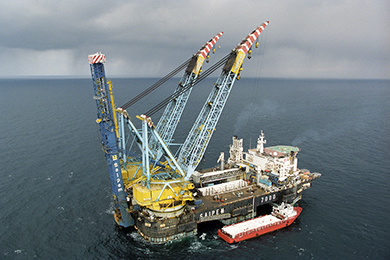 The Saipem drilling platform, which operates under license from the Cypriot government, was supposed to resume its activities. Turkey rejects the agreements signed by the Cypriot government with Israel and Egypt, claiming that they harm the interests of Turkish Cypriot community. However, others believe that Turkey is using the latter to control the oil and gas in the eastern Mediterranean. Istanbul (AsiaNews) – Turkish Navy ships have again stopped a drilling ship owned by Saipem, an Italian oil and gas company, threatening to sink it. The incident occurred 25 nautical miles southeast of Cyprus, in block 3, within the country’s Exclusive Economic Zone (EEZ). The commander of the Italian vessel was able to avoid a collision with Turkish naval ship. Saipem’s drilling platform had tried to resume its exploration for oil and gas based on the license issued by the Cypriot government. This is the second time that the Turkish Navy prevented the Saipem platform from exploring the seabed in Cyprus’s EEZ. A similar incident occurred in the same area a week ago, when the Turkish Navy warned the commander of the Saipem platform not to continue its operation because it was conducting military manoeuvres. When the latter ended, the platform tried to resume its activity. Following these incidents, the Saipem platform has moved away, whilst the Turkish Navy has extended its ban on exploration until 10 March. EU heads of government, meeting in Brussels, have been informed of the serious incident, as Cyprus is a member of the EU. Yesterday afternoon, Cypriot President Nicos Anastasiadis and Italian prime minister Gentiloni met. EEZs have been agreed by the countries in the eastern Mediterranean, under international treaties. In this case: Cyprus, Israel and Egypt. Experts believe that this part of the Mediterranean is rich in oil and natural gas. A platform owned by French oil and gas company Total is continuing to explore under the protection of a French naval ship. A drilling ship owned by US-based Exxon is making its way to the area with exploration licenses from Cyprus, Israel, and Egypt. Turkey does not accept the agreements signed by the Cypriot government with Israel and Egypt, claiming that they harm the interests of Turkish Cypriots. However, many in Brussels believe that Turkey is using the Turkish Cypriot community to control oil and gas in the eastern Mediterranean in order to control supplies to Europe.